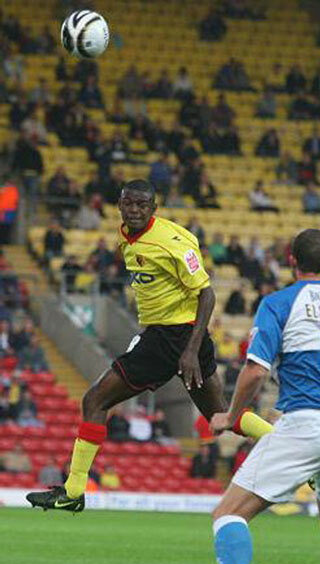 Striker Theo made his debut for Watford as a 17 year old at the end of the 2005-6 season at Queens Park Rangers. He then made a further substitute appearance the following season in the Premier League at home to Newcastle United. Having fallen out of favour, he moved to Huddersfield Town in 2009. Currently at Southend United, Theo spoke to Watford Legends in 2010. Hi Theo. Thanks for talking to Watford Legends, on this the last interview for the season. You were a trainee at Stoke City originally. How did you become a Hornet? I got released by Stoke City, and from there I got offered a fresh chance in the academy at Watford. Did you have other choices? I went to Sheffield Wednesday on trial but didn’t get much of a chance, and I also went to Walsall for a couple of training sessions but I didn’t really like it. With Watford you came through the academy and eventually made your debut against QPR. What do remember of your debut? It was quite an interesting debut as I was quite young, only 16 and suddenly I was playing against defenders like Danny Shittu! I had a good bit of time on the pitch and remember having a go with an overhead kick, but unfortunately I closed my eyes just before I hit it! Having made your debut you signed professionally and played against Newcastle in the Premier League. Is it pleasing to say that you have played Premier League football? Yes. It was only 10 minutes but it was a great motivator early in my career. The Premier league is somewhere I would like to get back to. The club sent you out to Hereford and then Southend. Did you find it worthwhile to go out on loan? Definitely. At that age it is important to get games, and match fitness. And even more so match experience. It is only in matches that you sharpen your awareness. You can only get that from playing senior games. Going to Hereford and Southend were really good experiences for me. Especially at Hereford where we had a great season. Did you find yourself getting kicked up in the air a lot in League Two? No too much. The standard is pretty good to be fair. It’s not as quick as the Championship but it’s still good. You eventually left the club and went to Huddersfield. Why did you go there? I wasn’t really playing at Watford, just coming off the bench here and there. Going out on loan had made me feel more keen to get the match experience. And Huddersfield was a great opportunity to play first team football. I had other options, but I knew Lionel Ainsworth and Peter Clarke who were there, and that helped me make the decision. It’s often difficult joining a new club but to have a couple of lads I knew helped. You had quite a good time at Huddersfield. Played a lot of games and chipped in with a few goals. What then made you go out on loan to Millwall? If you look at my stats I didn’t feel I played that much in comparison to the number of games the team was involved in. Sometimes I felt that I should get back in the team but didn’t. I did get in to the team and scored a few goals to get the team in to the play offs but was then not involved as much as I would like to have been for the play off games. And that was a bit of a decision maker for me to leave the club. And from Huddersfield you went to Millwall on loan, before then signing for them permanently. Yes Millwall expressed an interest in January when I was allowed to go out on loan. I was keen to make a move on loan as I didn’t want to spend another half season wondering about when I might get a chance to play. So that helped me make the decision to go to Millwall. You then very quickly went to Derby on loan from Millwall. There have been various rumours about this. What was that all about? There were certainly a few stories going around which were quite interesting to be fair! It stemmed from Derby having quite a long-term interest in me, and had had an interest since before I went to Millwall. So when they came in to take me on loan from Millwall I was happy to do so. It also meant that I could stay at my base and home area of the Midlands, so I could reduce the travelling time and spend more time with my friends. So as a Midlands lad it is quite useful to be at at Midlands Club then. You are 22 now, if we had a crystal ball and we had to take a look 5 years in to the future, where would you like to be? I’d like to be playing at high a level as possible. I have had a taste of playing in the Premier League and would like to do that again with a team who are there week in week out. That would be ideal. Where will you be next season? I’m unsure as yet but it’s something that will be sorted out in the summer. Thanks for your time Theo, all the best.